Iran Leader Releases 'Strategic' Statement on 40th Revolution Anniv. Home Politics Local Iran Leader Releases ‘Strategic’ Statement on 40th Revolution Anniv. Iran Leader Releases ‘Strategic’ Statement on 40th Revolution Anniv. Leader of Iran’s Islamic Revolution Ayatollah Seyyed Ali Khamenei has issued a “strategic and important” statement on the 40th anniversary of the Islamic Revolution of Iran, which toppled the US-backed monarchy in 1979. The statement, issued as a new chapter is opened in the Islamic Republic’s life, explains the path walked in the past forty years and the steps needed for further advances, the Leader’s official website said. In the statement, the Leader has stressed the unique role Iranian youth could play to help the country take its “second stride” towards ideals, explaining requirements for Iran’s progress in seven sections. 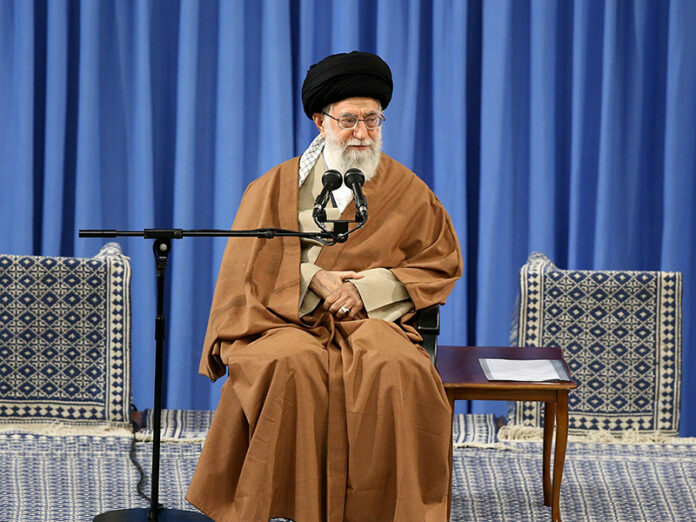 The Leader has further admitted the Revolution’s failure to realize justice in the Islamic society by saying that “we’re far far away from where we should be”, and stressed that the Revolution is prepared to correct its mistakes. Ayatollah Khamenei has also urged all Iranian officials to be “afraid” of deepening gap among social classes in the Iranian society. Among all the nations suffering from oppression, few make an effort to launch a revolution; and among those nations that have risen and launched a revolution, few have been witnessed to have pursued it to the end, or moved beyond merely changing the government and safeguarded their revolutionary values. However, the auspicious Revolution of the Iranian nation—which is the greatest and most popular revolution of the contemporary era—is the sole revolution that has persisted forty years of pride, saved from betrayal to its values, and it has preserved its dignity and original slogans against all the temptations which seemed irresistible; hence, entering the second phase of self-development, society-processing and civilization-building. Heartfelt salutations to this nation, the generation who initiated and continued [the movement] and the generation that currently steps into the magnificent and global phenomenon of the second forty years! The day when the world was divided into the material West and East, and no one presumed a major religious movement would emerge, the Islamic revolution of Iran stepped into the scene gloriously and mightily; it broke the frameworks; it flaunted to the world the outdatedness of the clichés; it put the religion and the material world together, and declared the coming of a new era. It was much expected that the leaders of deviation and oppression would react—but in vain. Whatever the right and left modernity did— from pretending to ignore this emerging and unprecedented voice to extensive efforts for suffocating it— just brought them closer to their indispensable demise. Today, after forty annual celebrations of the victory of the Revolution and forty Fajr ten-days, one of the two centers of animosity has already perished, and the second one is struggling with predicaments that signal its death in the near future. Whereas, the Islamic Revolution is advancing while preserving and adhering to its mottos. It is possible to assume an expiry date for anything, yet, the global mottos of this religious revolution are exceptional; they will never expire because they match human nature in all eras. Freedom, ethics, spirituality, justice, independence, dignity, rationality, brotherhood, are not limited to a single generation or society so that they would rise in a period and decline in the next. It is impossible to imagine a people who despise these values. The reported cases of reluctance to these values were due to the officials who had shrunken from these religious values; and not due to their adherence to them and endeavors for achieving them. The Islamic revolution—like a living and unwavering phenomenon—is always flexible and ready to correct its mistakes, but it is not revisionary or passive. It is positively sensitive to criticisms; it regards them as a divine blessing as well as a warning to those who do not act upon their words; yet it, by no means, takes distance from its values, which are blended with the religious faith of the people, thanks be to God. Since the establishment of the system, the Islamic revolution has never suffered from, and will never suffer from stagnation and recession, and it does not see any conflict and contradiction between revolutionary dynamism and political and social order; rather, it eternally defends the theory of the revolutionary system. The Islamic Republic is not reactionary and it does not lack perception and understanding in face of new phenomena and situations; however, it strongly adheres to its principles and it is highly sensitive to its frontiers in relation to its rivals and enemies. It never imprecisely regards its principle lines and considers it important as why and how it would persist. Undoubtedly, the gap between the musts and the realities has always tormented the idealist consciences; however, this gap is fillable, and in the past forty years it has been filled in many cases, and certainly in the future, with the presence of a young, faithful, wise and motivated generation, it will be filled more vigorously. The Islamic Revolution of the Iranian nation has been mighty, but merciful; forgiving and even oppressed. It has not committed any of extremist and deviated acts that have marked many other uprisings and movements with stigma. In no conflicts—not even against the United States or Saddam Hussein—did it ever shoot the first bullet and, in all cases, it defended itself after the enemy’s attack; of course, it blow the defensive strike vigorously. Since its inception, this Revolution has never been merciless nor has it ever shed blood; it has neither been passive nor hesitant. Standing assertively and courageously against bullies and thugs, it has defended the oppressed. This revolutionary bravery and gallantry, this honesty, assertiveness, and sovereignty; this global and regional realm of action in support of the oppressed of the world represent a source of pride for Iran and the Iranians, and may it persist eternally! Now, at the beginning of a new chapter in the life of the Islamic Republic, I would like to address my dear young people: the generation who steps up to start another part of the Great Jihad [selfless endeavor] for building a great Islamic Iran. The first section of my address concerns the past. Dear ones! You cannot learn but from your own experience or listening to the experiences of others. Many of what we have seen and experimented, your generation has not experienced and seen yet. We have seen and you will see. The decades ahead are your decades, and it is you who should protect your revolution while you are qualified and full of motivation, and move it closer to its great ideal: that is, the emergence of a new Islamic civilization and the preparation for the rising of the great sun of wilayat (may our souls be sacrificed for him) [Imam Mahdi (a.s.)]. To take steady steps in the future, we need to develop a good knowledge of the past and learn from the experiences. If this strategy is neglected, lies will replace the truth, and the future will be menaced by unknown threats. The adversaries of the revolution are strongly motivated in their efforts to spread distortions and lies about the past and even the present, exploiting money and all the necessary tools for it. The bandits of thought, creed and awareness are ample; the truth cannot be heard from the enemy and its troops. The Islamic Revolution and the establishment that rose from it started from scratch. Firstly, everything was against us: the corrupt regime of Taghut [Pahlavi tyranny]—which, in addition to its dependence and corruption, tyranny and being coup-based—was the first royal regime in Iran that was brought to power by the foreigners rather than by the force of sword; the government of the United States and some other Western governments; or the extremely chaotic situation inside Iran; and the shameful backwardness in science and technology, politics, spirituality, and any other virtue. Secondly, there was no precedent experience before us and the path ahead of us had not been treaded. Obviously, Marxist uprisings and the like could not represent a role model for a revolution that emerged from the heart of Islamic faith and knowledge. Islamic revolutionaries began without an example and experience, and the combination of a republic and Islam and the means for the formation and progress of it were not achieved except through the divine guidance as well as the luminous heart and the great thought of Imam Khomeini. And this marked the first brilliance of the Revolution. Then, the revolution of the Iranian nation transformed the bipolar world of that day into a three polar world, and then, with the fall and disappearance of the Soviet Union and its allies and the emergence of new poles of power, the new dichotomy of “Islam and the Arrogant Front” became a prominent phenomenon of the contemporary world and the focal point that is attracting the world’s attention. On the one hand, the aspirated look of the oppressed nations, freedom-seeking movements and some independence-seeking states of the world fixated on it; and on the other hand, it was screened by resentful and malicious eyes of the world’s bullying regimes and blackmailer thugs. Such, the world adopted a different orientation, and the seismic power of the Revolution shook the untroubled pharaohs. Hostilities began with all intensity; if it was not due to the magnificent power of the faith and the motivation of this nation and the heavenly and endorsed leadership of our imminent Imam, it was impossible to resist the hostility, conspiracy, and vice [directed at us]. In spite of all these onerous problems, the Islamic Republic took greater and stronger steps day after day. The past 40 years exhibited great jihads, brilliant achievements and amazing advances for the Islamic Iran. The magnitude of the progress made by the Iranian nation in the last forty years is well-recognized when compared to similar spans following other major revolutions such as the French Revolution, the October Revolution of the Soviet Union and the Indian Revolution. The jihadi management strategies inspired by Islamic faith and the belief in the principle of “we can do it”—that Imam Khomeini (r.a.) had taught us all—assisted Iran in its achievement of dignity and progress on various arenas. Firstly, it guaranteed the stability and security of the country; the territorial integrity and the protection of the borders—which were targeted by the enemy’s serious threats—and gave rise to the miracle of victory in the eight-year war, leading to the defeat of the Ba’athist regime, and its American, European and Eastern supporters.